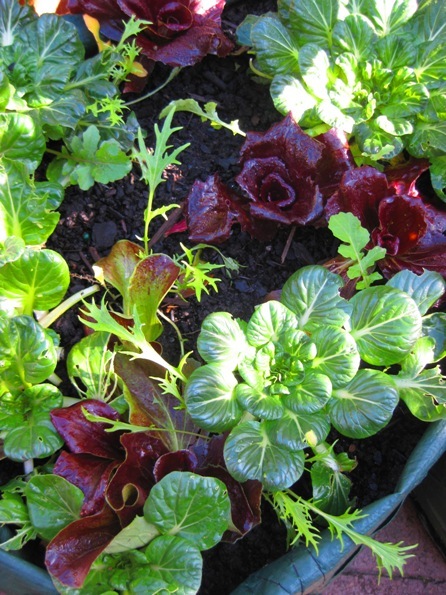 This is one of my most attractive garden beds, planted in a transportable planting bag. It’s called Mesclun. The name comes from Provençal (Southern France) — mescla, “to mix”— and literally means “mixture”. Mesclun is thus a salad mix of assorted small, young salad leaves. The traditional mix includes chervil, arugula, leafy lettuces and endive in equal proportions, but modern versions may include a mix of lettuces, spinach, arugula(rocket, or roquette), Swiss chard (silver beet), mustard greens, endive, dandelion, frisée, mizuna, mâche(Lamb’s Lettuce), radicchio, sorrel, and/or other leaf vegetables. This planting contains tatsoi, rocket, mizuna, radicchio, cos lettuce and a couple other lettuces I can’t identify. I regularly plant pots and bags with mesclun seeds in broadcast style, and I just wait and see what pops up. I have leaves available almost all year round. When life gets intense, I just come out into the warm noonday sun and feast my eyes on nature’s beauty. So wonderfully therapeutic!